In his next outing, on Monday, he did just that, pounding the zone early with mixed results. He gave up three hits—all on fastballs—and a run in the first inning. However, this time, he allowed no walks and finished the second and third innings in strong 1-2-3 fashion. Shawaryn’s delivery is unique, coming from a low three-quarters arm slot and creating deception for batters. “The Unicorn,” as Shawaryn was nicknamed in college, explained that it is a natural arm angle for him, and that while he experimented with some mechanical changes in college, the low arm slot is nothing new. Shawaryn’s fastball was sitting 92-93 mph in both outings, topping out at 95. 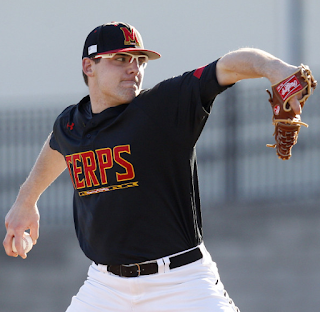 It was the loss of that velocity for a time this spring at the University of Maryland that likely led to his falling to the Red Sox in the fifth round come June. After putting up a 1.71 ERA his sophomore season and setting the single-season record in strikeouts for the Terps with 138, he was viewed as likely to go in the top couple rounds of the draft the following year. With the drop in velocity, he also saw his results fall off, posting a still-solid, if unspectacular, 3.18 ERA. Baseball America still ranked Shawaryn 77th-overall on its draft prospects list, but he slid to the Red Sox at pick 148. Fast-forward to August, and the velocity has returned. Shawaryn is unsure what led to the drop in velocity, as there was never any injury identified. In addition to good velocity coming from a tough arm slot, he showed the ability at times to command the fastball to both sides of the plate in both outings. On Monday, he featured his slider and changeup more frequently, with the slider being his best out-pitch. The slider showed ability to miss bats and get hitters off balance, with some ugly check swings and swing-and-misses against it. As for his nickname, “The Unicorn,” one might think it had to do with his mythical pitches, or perhaps his atypical arm slot, but in fact, it has a more obscure origin. The Red Sox did not have the same problem, as they were able to lure him away from another year in college with a sizable bonus. In fact, he received the most money above his slot allotment of any draftee this year other than first-rounder Jason Groome, signing for a $637,500 bonus, $262,000 above slot. Clearly, the Red Sox saw an opportunity to steal a talent in the middle of the draft’s second day when they selected Shawaryn. If the early results—and looks—are any indication, they may have done just that.